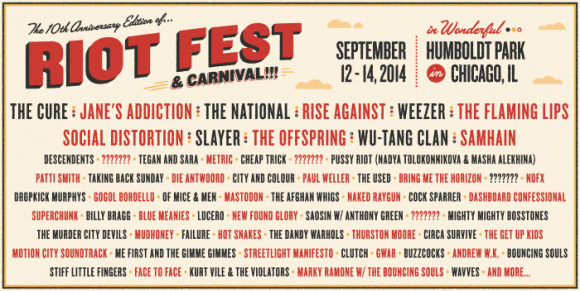 Riot Fest is always something to celebrate, however this year there is even more of a reason because it’s the 10th anniversary. From Riot Fest veterans, to festival rookies the festival is bringing an eclectic array of artists. Legendary band reunions and a handful of surprises are absolute, including a panel discussion by P*ssy Riot. Nadya Tolokonnikova and Masha Alekhina are Russian conceptual artists and formerly imprisoned activists that will be giving an interactive talk. More details will be announced in the coming weeks.